This picture is very artistic! I was just wondering what do you do with all fo the leaves. You don't have to rake the yard, right?? Nice photo. I prefer autumn leaves to frost or snow any day. 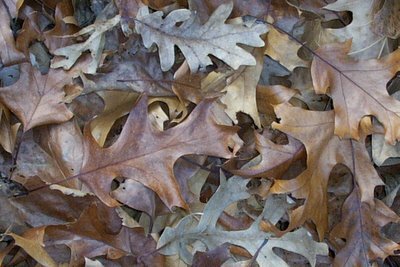 I would never rake my leaves, I think they are so beautiful when they are covering the yard. How can you resist all of those vibrant colors? Those leaves are gorgeous... I can practically hear them crunching under foot. You're an inspiration! Keep it up! So nice to hear from you. Yes, those are mostly oak leaves. What do we do with all of the leaves? Absolutely nothing except enjoy looking at them! Mother Nature takes care of the forest floor, and our actual "yard" around the house doesn't get too leafy. I do own a rake, and sometimes I'll throw a whole bunch of leaves into a compost bin to make leaf mulch, but they don't break down real fast and so you have to let them sit there a while (like up to a couple years). "Cybersniff"--I like that. And you're very welcome. What I can't believe are the people with these humongous yards who rake up all their leaves and then pay to throw them away. Same with lawn clippings and other yard debris. What a waste (ha ha ha). But really, I would love to see more people with compost bins. Even if you have to wait a year for leaves to break down (and that's only if you just pile in leaves and do nothing to them, like turn them or add other stuff), there is no work involved. And then you have this wonderful amendment for your soil.